We recommend Orient Hall for you if you are looking for a covered venue, which opens from the main building and known as one of the largest floor area of Budapest with its 3000 sqm continious, heated hall. The ceiling of the hall was designed to make possible to build up of sound and light equipments, special decor and displays. 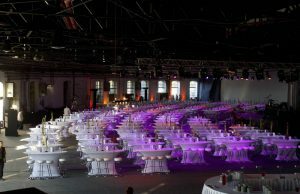 Orient Hall capacity is 1500 people due seated reception, 2500 people due standing reception, conference and concert. Hall territory can be divided by elegant dining cars or huge steam locomotives, which makes possible to have more locations in one event or tighten it when having small events.